Box Text: You think you want to be King? Get real. You're starting life as Simba, the cub. To survive and grow into a powerful adult lion, you must perfect your savage pounce, reckless roar and master fighting with all four paws. If you survive the challenge, you'll grow into a strong, ferocious adult lion. So prepare to scrap with hyenas. Blast through an elephant graveyard. Battle an in-your-face stampede of trampling wildebeests. And you'd better quit hanging with slackers like Timon and Pumbaa, unless you want to be scarfing bugs the rest of your life! Are you sure you want to be King? Then it's time to cut loose in the deadliest one-on-one brawl ever. Defeat your evil Uncle Scar. Recapture the Pridelands. And reclaim your rightful place in the Circle of Life. - A radical variety of gameplay the follows the adventures of the hit movie THE LION KING through 10 levels of action, puzzles and combat. -Fast, super smooth, movie-like animation, hand-drawn by top Disney animators and packed with the latest Digicel technology in a 24-meg cartridge. -All 9 music selections from the movie, including "The Circle of Life," "Just Can't Wait to Be King" and "Can You Feel the Love Tonight?," composed by Elton John and Tim Rice. 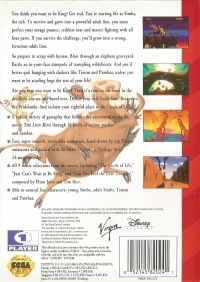 -Able to control four characters: young Simba, adult Simba, Timon, and Pumbaa. 02-20-2018 tripredacus Box Text You think you want to be King? Get real. You're starting life as Simba, the cub. To survive and grow into a powerful adult lion, you must perfect your savage pounce, reckless roar and master fighting with all four paws. If you survive the challenge, you'll grow into a strong, ferocious adult lion. So prepare to scrap with hyenas. Blast through an elephant graveyard. Battle an in-your-face stampede of trampling wildebeests. And you'd better quit hanging with slackers like Timon and Pumbaa, unless you want to be scarfing bugs the rest of your life! Are you sure you want to be King? Then it's time to cut loose in the deadliest one-on-one brawl ever. Defeat your evil Uncle Scar. Recapture the Pridelands. And reclaim your rightful place in the Circle of Life. 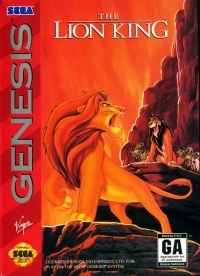 - A radical variety of gameplay the follows the adventures of the hit movie THE LION KING through 10 levels of action, puzzles and combat. -Fast, super smooth, movie-like animation, hand-drawn by top Disney animators and packed with the latest Digicel technology in a 24-meg cartridge. -All 9 music selections from the movie, including "The Circle of Life," "Just Can't Wait to Be King" and "Can You Feel the Love Tonight?," composed by Elton John and Tim Rice. -Able to control four characters: young Simba, adult Simba, Timon, and Pumbaa. 06-01-2013 foxhack Box Text You think you want to be King? Get real. You're starting life as Simba, the cub. To survive and grow into a powerful adult lion, you must perfect your savage pounce, reckless roar and master fighting with all four paws. If you survive the challenge, you'll grow into a strong, ferocious adult lion. So prepare to scrap with hyenas. Blast through an elephant graveyard. Battle an in-your-face stampede of trampling wildebeests. And you'd better quit hanging with slackers like Timon and Pumbaa, unless you want to be scarfing bugs the rest of your life! Are you sure you want to be King? Then it's time to cut loose in the deadliest one-on-one brawl ever. Defeat your evil Uncle Scar. Recapture the Pridelands. And reclaim your rightful place in the Circle of Life. - A radical variety of gameplay the follows the adventures of the hit movie THE LION KING through 10 levels of action, puzzles and combat. -Fast, super smooth, movie-like animation, hand-drawn by top Disney animators and packed with the latest Digicel technology in a 24-meg cartridge. -All 9 music selections from the movie, including "The Circle of Life," "Just Can't Wait to Be King" and "Can You Feel the Love Tonight?," composed by Elton John and Tim Rice. -Able to control four characters: young Simba, adult Simba, Timon, and Pumbaa. This is a list of VGCollect users who have Lion King, The in their Collection. This is a list of VGCollect users who have Lion King, The in their Sell List. This is a list of VGCollect users who have Lion King, The in their Wish List.